If there’s one person who isn’t having any of Trump’s remarks about “both sides” being at fault in the Charlottesville incident, it’s CNN’s Don Lemon. On Tuesday, Lemon offered his own response–along with scathing words and a rapid-fire history lesson for POTUS. CNN has a variety of programs hosted by a diverse group of anchors. Some viewers prefer hosts with a legal background, such as Chris Cuomo, while others prefer polarizing figures such as Don Lemon. But who is the most popular? We're glad we asked on your behalf, because here are CNN’s Top 10 daily news programs, based on total viewers*. 10. “Morning Express” with Robin Meade is technically on CNN spinoff network HLN, but she is often featured on CNN specials such as “Quiz Show” and averages 282,000 viewers. 9. “New Day” with Chris Cuomo and Alisyn Camerota recently lost co-host Michaela Pereira to HLN, but recently averaged 438,000 viewers in its 6-9 a.m. ET timeslot. 8. "Legal View" with Ashleigh Banfield averaged 611,000 viewers at noon ET in April. 7. “At This Hour” with John Berman and Kate Bolduan is anchored by two rising stars at the network, where they've been used on various programs as replacement hosts. Together, their 11 a.m. ET broadcast recently averaged 599,000. 6. "CNN Newsroom" is hosted by Brooke Baldwin, Carol Costello, Fredricka Whitfield and Poppy Harlow, but never at the same time, being a single-anchor program. It's 640,000-viewer average is split between the show's two primary dayparts: Costello's, from 9-11 a.m. ET, and Baldwin's, from 2-4 p.m. ET. 5. “The Lead with Jake Tapper” covers the day’s top stories with a focus on politics and political newsmakers, having recently averaged 756,000 viewers at 4 p.m. ET. 4. “The Situation Room with Wolf Blister" remains extremely popular, despite comedian Larry Wilmore recently ripping it at the White House Correspondents' Dinner. Airing in the 5 p.m. ET timeslot, it averaged 784,000 viewers in April. 3. “Erin Burnett Outfront” recently averaged 830,000 viewers, airing weeknights at 7 p.m. ET. 2. 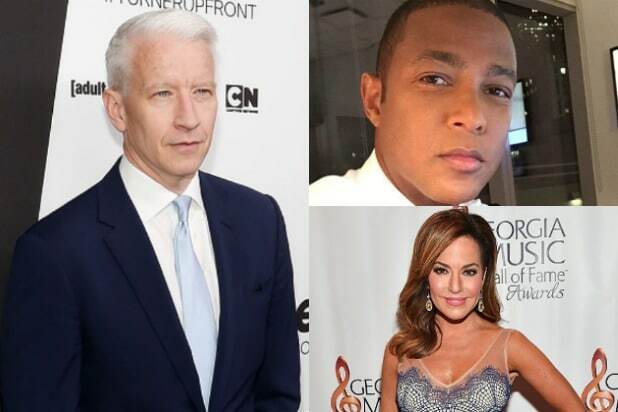 “CNN Tonight” with Don Lemon is the network's second most popular show, averaging 807,000 viewers in April. It typically airs at 10 p.m. ET, but is often extended or shifted for coverage of breaking news. 1. Anderson Cooper’s “AC360” is the most-watched show on CNN according to recent figures, averaging 988,000 viewers in April. In its primetime 8 p.m. ET timeslot, the show is often the home of political town halls and exclusive interviews.